We feel that for this week’s installment, there can be little argument. This is the number one greatest game played at Jordan-Hare not only during the particular time frame of this series, but EVER. You know the game of which we speak. Unveiling it here is but a formality. Still, there is much to be said about it. It was an Iron Bowl—though of course not just any Iron Bowl. Auburn had won the previous three clashes with Alabama. An entire graduating class of Crimson Tide players faced the very real and nearly unthinkable prospect of having spent their entire college careers never having beaten Auburn. The SEC Championship was on the line; Alabama was undefeated while Auburn had suffered one conference loss, at Tennessee. A win by Auburn would force a three-way tie for the title, and give the Tigers their third straight SEC crown. It was a game against the second-ranked team in the country, and so there were national championship implications, as well. Most importantly of all, though, it was the game that has come to be known simply as “First Time Ever.” It marked the first time in history that the University of Alabama played a football game against Auburn University in the confines of Jordan-Hare Stadium. As Pat Dye said beforehand, the fact that the game was being played at all in Auburn was a bigger story than whatever the outcome might turn out to be. The game had been played in a variety of locations prior to 1989, settling finally and seemingly permanently in Birmingham’s Legion Field. The teams alternated “home” years in that same stadium, and the crowd was always (allegedly) divided 50/50 between the two schools. Even so, Alabama clearly enjoyed a tremendous advantage by playing the game there every year, for a variety of reasons including the playing surface of the field, the overwhelmingly pro-Alabama nature of Birmingham, the fact that the Tide played several other home games each season in that stadium, and the statue of their coach right outside the gates. Bear Bryant knew full well that his teams enjoyed an advantage playing there every year and he took steps to prevent any changes from happening. He worked out a contract with Auburn, prior to Pat Dye’s arrival, that would see the game played in Birmingham at least through the end of the decade—and well beyond, if things remained the way they always had been. Things would not remain the way they always had been. Patrick Fain Dye intended to see to that. When discussion between the two universities turned to a heretofore-perfunctory renewal of the Legion Field contract, Dye informed the powers at the Capstone that Auburn intended to move the game in Auburn’s home years to Jordan-Hare Stadium. By Auburn’s reading of the contract, that meant 1989 would be the year it moved to the Plains. Alabama begged to differ. According to their reading of the contract, the game was set to be played at Legion Field at least through the 1991 season. Perhaps the conflict was already worked out; perhaps it would have been under any circumstances. But it didn’t hurt that the intransigent Perkins left Tuscaloosa for the Tampa Bay Buccaneers following the 1986 season, replaced by new head coach Bill Curry and new Athletic Director Steve Sloan. Sloan in particular had a different view on the situation, stating publicly that home-and-home arrangements didn’t harm other big traditional rivalries such as Ohio State-Michigan or Southern Cal-Notre Dame. In any case, soon after Curry and Sloan arrived at Alabama, the Tide’s position changed in principle and they agreed that the games in odd-numbered years would be played in Auburn. One sticking point remained, however. Auburn had to play the 1989 game in Birmingham instead of Auburn, Sloan and company stated, as per their interpretation of the contract. 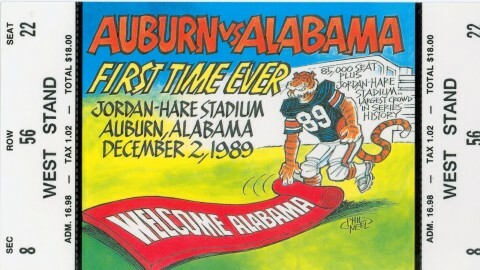 In response to this, Pat Dye simply dug in his heels and said no, the 1989 game would be played in Auburn. Finally, to break the impasse, Dye agreed to play the 1991 Iron Bowl in Legion Field—a “bone thrown to Alabama,” as he later described it, to reach a peaceful agreement. 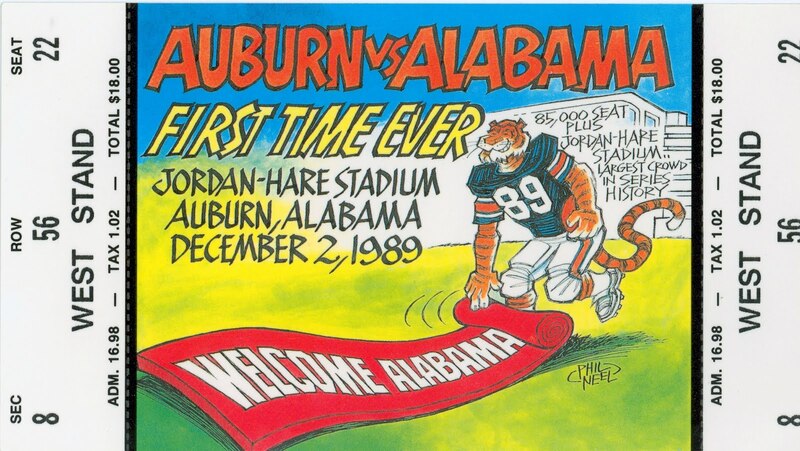 So the 1989 Iron Bowl was coming to Jordan-Hare Stadium. Tigers fans rejoiced. Quickly, however, thoughts turned to the game itself: What if, after all the acrimony and threats and bombast, we actually lost the game? Surely that wasn’t likely though—right? After all, Auburn was on a three-game winning streak over Alabama coming into 1989, and the previous year’s Tigers team had been one of the best in school history. Just how good could the Tide be, to actually threaten to defeat Auburn in the First Time Ever? The answer, almost horrifyingly for Auburn fans, turned out to be “very, very good.” As the 1989 season rolled around and the weeks and games flew by, Alabama looked more and more like a powerhouse. The ’89 Auburn team, on the other hand, seemed to be struggling to find itself. Yes, we would get Alabama in our stadium at last—and it looked increasingly as if they would beat us there. Only two of the state’s 24 sportswriters with a vote in the Associated Press poll picked us to win. A sort of dull, sinking feeling set in among many of the Tiger faithful. We didn’t give up hope—none of us did. But we worried. Each in our own quiet, introspective way, we worried. Part of the reason for concern was that the Tigers still hadn’t quite come together as a solid team most of the way through the ’89 season. In previous years, Dye’s teams had a way of suddenly clicking on offense and defense in one game—usually one early-season game—and then rolling along into the tough season-ending stretch of “Amen Corner” contests at top gear. But the ’89 squad sputtered and stumbled, never quite seeming in synch, dropping road games (to quality opponents) at Knoxville and Tallahassee. Alabama, meanwhile, rolled up the yards and points against Tennessee; their offense, under the command of Homer Smith, appeared unstoppable. Yes, we’d finally gotten what we wanted—Alabama in Jordan-Hare—and it looked very much as if we were going to live to regret it. We could only hope that a beating would indeed be administered later that afternoon, and that the guys in blue and white would be doing the beating. Before the game, rumors swirled that Tide fans planned to roll Toomer’s Corner with red toilet paper if the unthinkable happened and Alabama won. In a strange foreshadowing of much darker and more recent events, Tigers fans quickly drew up contingency plans to rendezvous post-game at the Corner and protect the Oaks at all costs. Auburn students began gathering outside the gates to the stadium before dawn, though kickoff on CBS was not until 1 pm. We made our way past RVs that had been parked in vast numbers all over campus as early as Monday of game week; in all the time John and Van attended Auburn prior to that game, neither had seen more than few campers arriving on campus earlier than Thursdays of game weeks. The atmosphere outside the stadium was electric. Some people had brought cards or games and attempted to play while waiting for the gates to open, but no one could really focus on anything other than what was to come later in the day. Nearly everyone seemed to float on air. “Body Getta” and “Two Bits” and other Auburn cheers were shouted and echoed back over and over, with scarcely a break in between, for hours. “War Eagle” tumbled easily and often from every pair of lips. “From the cradle to the grave,” intoned CBS’s Jim Nantz from atop Haley Center in the broadcast lead-in, “football borders on religion in the state of Alabama.” Truer words were never spoken, as the national viewing audience was about to find out. After the first of what would be several long bombs to Alexander Wright, Auburn went up 7-0 on a James Joseph one-yard plunge. Alabama struck back with a field goal and touchdown of their own—and would have added more, but a fake field goal attempt was snuffed out by the Tigers defense. Even so, at the half, terrifyingly, Alabama led, 10-7. The second half would be nearly all Auburn. Two long passes from Reggie Slack—one to Shane Wasden, the other to Alexander Wright—set up another touchdown and a Win Lyle field goal. Suddenly Auburn was back in front, 17-10. A Darrell “Lectron” Williams touchdown run put the Tigers ahead by fourteen, and another Lyle kick appeared to have pushed the game out of reach at 27-10. Auburn players celebrated on the sidelines with as much glee as most of the fans in the stands at that point. Alas, the scoring was not done yet. Alabama came back to ring up ten more points in the final eight minutes, pulling within only seven of Auburn, but an onsides kick failed. Lyle knocked home one last field goal for the Tigers to make the final score 30-20. The crowd was delirious. For the first time ever, Alabama had come to Auburn to play the Iron Bowl—an undefeated, second-ranked Alabama, no less—and Auburn had won. A literal “purple haze” floated over the stands, a result of the 60,000-plus orange and blue paper shakers that had been distributed before kickoff. (The Auburn Student Government Association had been setting aside shakers all year so that almost everyone in the stadium could have one for this game.) Fans were coughing and sneezing “shaker dust” for hours afterward; many joked that we would probably come down with some strange orange-and-blue variety of lung cancer later in life—but it had been for a worthy cause! For years afterward, Alabama fans, notorious in their tendency to seek any available excuse for a loss, countered any mention of this game with, “There was no way Alabama could have been expected to win in that environment.” Auburn fans didn’t care what excuse the Tide fans wanted to console themselves with, though. The good guys had won. That was all that mattered. They faced the mighty Tide in their own house for the First Time Ever. * The stated maximum capacity of Jordan-Hare during the 1989 season, and for several years afterward, was 85,214. For this game, however, an additional one hundred attendees were somehow allowed inside, thus causing this game to hold the record for the largest attendance at a football game in the history of the state of Alabama for quite some time. Some accounts claim attendance was only 85,214 for this game as well, but that is simply not accurate. **It says a great deal about both programs that there was a “brick” associated with each program during the Dye/Curry era. The Auburn brick is the one Pat Dye had engraved with the score of this game, to keep on his desk, after referring to the game as “the last brick in our house.” The brick associated with Alabama, of course, is the one a disgruntled fan threw through Coach Bill Curry’s window after the Tide lost a game to Ole Miss. ***Depending on how one calculates decades, of course; it was the last game played while the calendar read “198_.” Auburn’s bowl game that season was the Hall of Fame Bowl, played on Jan. 1, 1990. Top photo from “Auburn Football Vault.” Ticket via War Eagle Extra. Related: “20 Years,” TWER’s collection of 2009 posts celebrating the 20th anniversary of the First Time Ever, includes the best Auburn suit you’ve ever seen, Aubie dancing to Janet Jackson, Stacy Danley’s daily itinerary, a book written about the 1989 Iron Nowl by a 5th grader, a rap about the game, and an interpretation of the modern meaning of the game. I can only imagine what it was like to be an Auburn fan when this game was played. I attended Auburn and became an Auburn man in 2003-2004 so my history is limited. I have witnessed things other Auburn men and women have waited a lifetime for. I am very blessed to have witnessed 2004 and 2010, but it would have been incredible to be there in 1989 and see our boys win that game. Great article, enjoyed every word, keep up the great work. War Eagle!! Don’t forget, at many thrift stores across the south are the famous Bama t-shirts that read “We’ll Kick Your A$$ on Your Own Grass,” printed before the game, of course. Good times. “There was no way Alabama could have been expected to win in that environment.” I laughed out loud at this. Great article! I bought a sign after the game (right outside the stadium) that said: We Beat the Number Two Out of You! 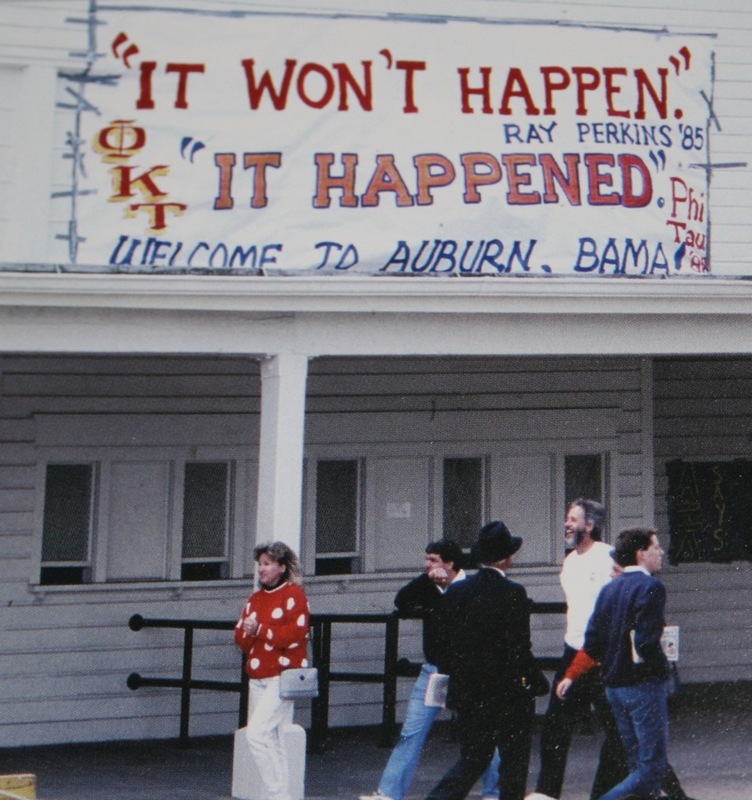 I painted that banner above the barn for my fraternity , Phi Kappa Tau , which i was an advisor at the time and living in Auburn . The atmosphere was crazy and ominous that week as we feared a bama celebration at Toomers if Bam won ….coupled w Bill Currys death threat comment , it just got silly . Liston Eddins and I publshed the book “Tiger Walk to Victory ” , a photo story of thewhoe game …..ironically , bama decided to move their game to Tuscaloosa later too ! So much for “tradition of L egion Field ” as they used to claim when we wanted to play OUR HOME game in Auburn . Thanks Pat Dye! Hey, Barry! An honor to have you here, sir. And glad I mentioned remembering that banner, which (I assume) prompted our great editor here, Jeremy, to dig up that photo– and thus we all now know who painted it! For over 20 years I’ve remembered it fondly. I have watched “The first time ever” several dozen times, and cried during most of them. I have also stated to my closest friends,”The ’63 Packers could not have won that game if they wore Crimson and White uniforms. Goose bump raising is becoming something you guys do here, quite well. I have to agree this is the watershed moment for AU Football. Ga Tech and Tennessee had long ago abandoned their requirement to not play in Auburn, so getting the school from Eastern Mississippi to come here was huge. I remember driving home from Indiana that week, and starting to see the banners on 280 at Alex City. Then driving through Waverly and seeing all the orange and blue in that little town was incredible. This was my wife’s first AU-‘bama game and it blew her mind. She just could not believe it! A great day in the history of our fine institution. Still have my stub. I was there, living in the PKT house at the time…and remember the build up to that week…intense. Barry, I do not remember much from that week, but I remember the intensity and that sign! WEGL! That quite accurately describes the eight-or-so weeks between the Tennessee game (the less said about which, the better) and the First Time Ever, but speaking solely for myself, the ‘stomach-churning nervousness’ ended when my eyes popped open around dawn that day. Literally from that moment, I knew the game was a win. I jumped out of bed (a decidedly-rare occurrence in my 20’s) to find all my roommates still sleeping off Friday’s pre-game party. So I headed up to the Auburn Grille (RIP), had breakfast, and spent the rest of the morning drifting around campus for a couple of hours, until it was time to hit the student section gates. We were in when they opened, and missed the now-famous Tiger Walk as a result. The AU student section was nearly full almost immediately, followed by the Turd visitors section, and the war was on, full volume, right there, over two hours before kickoff. I still remember Bill Curry, Jr., who must have still been in high school, standing on the visitors’ bench with his back to the field and sneering at the Auburn student section during warmups (he was, as you might imagine, not accorded a warm welcome in return). I only got to see that game on TV as I lived in Jacksonville, Florida, and I was lucky to see it then (I had to work that morning). I remember thinking beforehand “What a year to have the first Iron Bowl at AU” because we were not as strong as expected, and Bama was eating up the competition. During the game, although AU seemed dominant, and we were up by a touchdown late, Dad and I were telling the sportscasters to SHUT UP with their saying “Auburn has been SO dominant all game” and “There’s going to be a lot of partying at Toomer’s if this ends the way it should end”–as we both knew what could happen at any time in the Iron Bowl. So, as the clock ticked down, instead of mad feelings of joy, we both felt a simple relief that another year we were spared the ignominy of being on the short end of the Iron Bowl stick (which is how it is most of the time, ain’t it!). I was fortunate to be given a ticket and invited to the game with a friend. my stub and game program are framed on my office wall. As you know, Mr. Phil Neely did a commemorative cover for the program in addition to the ticket. You are so right that worry and dread had set in the minds of many fans including myself. But I will never forget the feeling of confidence that overwhelmed me within minutes of waking that game day morning to the reality of what would occur that day. That the Iron Bowl would indeed be played at Jordan Hare Stadium for the first time ever. I remember not denying that euphoric energy by telling myself that there was just no way under the sun that the Auburn family, the entire Auburn family, could let this day end without claiming what was a total victory. That “feeling” urgency to see that our will would be imposed on our rival only gre and grew and grew with each passing minute right up until victory was assured. Not before and not sine have I experienced any other Auburn moment like it. Indeed, it is the greatest game ever played in Jordan Hare Stadium. It is utterly impossible to imagine that ever changing and thank God and my wife’s co-worker that I was able to witness it in person. Oh, I forgot to mention that my wife was very pregnant with our firstborn child but never was there a question that I shouldn’t go, in her mind or mine. Our son was born on December 19, 1989.
oh my, ….. meant to say Mr. Phil Neel, not Neely. I blame iPad2 auto-correct.